Now then. Standard NARC. policy is that we don’t cover tribute acts or nights – when there’s so much exciting new music across the region to squeeze in, why waste the time talking about yesteryear? Like most things in life though, there are exceptions, and the 20th Anniversary of OK Computer night scheduled at The Cluny for Saturday 26th August is just that. As well as being Radiohead’s most beloved album to this day (although whisper it – In Rainbows and Kid A are probably better), OK Computer is also their most influential, offering a grandiose rock vision that many have tried to emulate or reference in the years since. As such, The Newcastle Gig Guide and 104 Records (the promotional arm of Parastatic) have gathered together a crack line-up of local talent to mark the occasion. Billed as offering a mix of Radiohead and original material, the line-up includes innovative electro-rock duo What We Call Progress and the majestic post-rock of Ten Sticks, whilst headlining the evening is a very special one-off supergroup featuring members from A Festival, A Parade, Young Liar, The Great Curve and Apologies – yes folks, Kid Aye! are here and ready to bring the classics back to life. Let’s hope they’ve been practising those Thom Yorke dance moves as well. 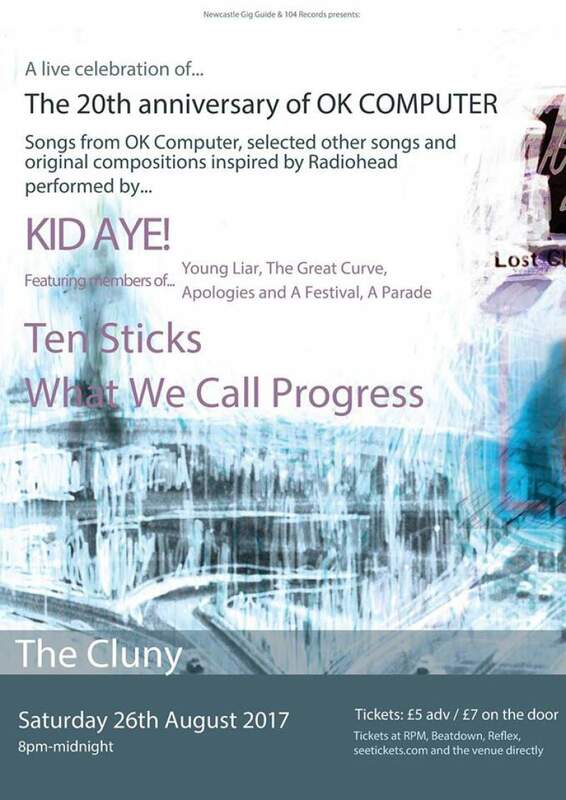 The 20th Anniversary of OK Computer night is at The Cluny, Newcastle on Saturday 26th August.